GOVERNORS ISLAND — Off a leafy path on Governors Island, a historic home has become the city’s center for a light-bending form of art: holograms. The Center for Holographic Arts, also known as the Holocenter, has taken over a 19th century building with quirky hologram exhibits and workshops for the summer. The Holocenter brought its art, made using diffracted light, to Governors Island after losing its space inside Long Island City’s Clock Tower building in 2014. And Mrongrovius said they like to encourage that kind of wonderment with holograms, it's what the art form is all about. As some high school age visitors meandered in on a recent afternoon, Mrongovius’s husband, Harun Triplett, who also works in the center, gave them some enthusiastic instruction. A walk through several dimly lit rooms, with creaky wood and peeling paint walls, adds to the spooky feel of the some the pieces. On display now are what Triplett calls some of the classics of holography, with art from artists all over the world. Some pieces span back to the 1970s. One piece, by artist Ray Park, called Co-existence: Banana, captures the “light body” or “soul” of the banana, Triplett said. 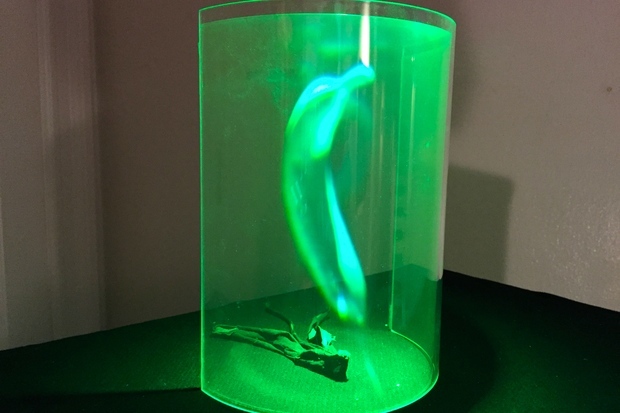 A 3-D image in light of the banana, which appears suspended in glass, hovers above an old banana peel. Also on exhibit are a series of portraits constructed from laser light, from artist Ana Maria Nicholson. Images of people including broadcaster Walter Cronkite, singer Tony Bennett, and artist Keith Haring seem to move and transform as you walk by them and peer at the portraits from different angles. As the summer moves on, the center will also host several workshops and rotate exhibits, Mrongovius said. Head to their website for more information. Ultimately, Mrongrovius said she hopes the center will have a permanent, year-round home on Governors Island. The Holocenter is open 12 p.m. to 6 p.m. Saturdays and Sundays and by appointment during the week.